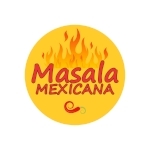 Hello Masalitos! We are so excited to be back. We had a tough time deciding what recipe to post first for our official re-launch. Tried several different recipes, and finally decided on Paneer with Salsa de Molcajete. It's fast and easy to make; it's also vegetarian and full of flavor. Buen provecho! I first thought of this recipe back in 2008, can you believe it? I keep a working document of recipe ideas and this was one of the first that made it to the list. Never got around to making it because I didn't have a molcajete back then... actually, I just got my very first molcajete a few months ago! Could I have made this without a molcajete? Yes, and so can you, if you don't own a molcajete but the truth is that salsa tastes soooooo much better when made in a molcajete. If you want to use a blender or food processor, follow the same instructions for prepping the ingredients and just pulse them a few times. I posted the full recipe for the molcajete salsa on a separate post because it can be used on its own as a dip for tortillas or as an addition to other recipes, so thinking ahead, I thought it'd be better to have it as a stand-alone recipe. For all the details, please go to the original post for Salsa de Molcajete. I always keep this in my fridge, so it's always ready to go for any recipe or snack - big timesaver! Paneer is an Indian cheese that doesn't melt. It's similar in taste to Mexican Panela Cheese but has a denser/firmer consistency. It is often sold in blocks or already cubed; you can also find it pre-fried but I don't recommend it, it's too chewy in my opinion. 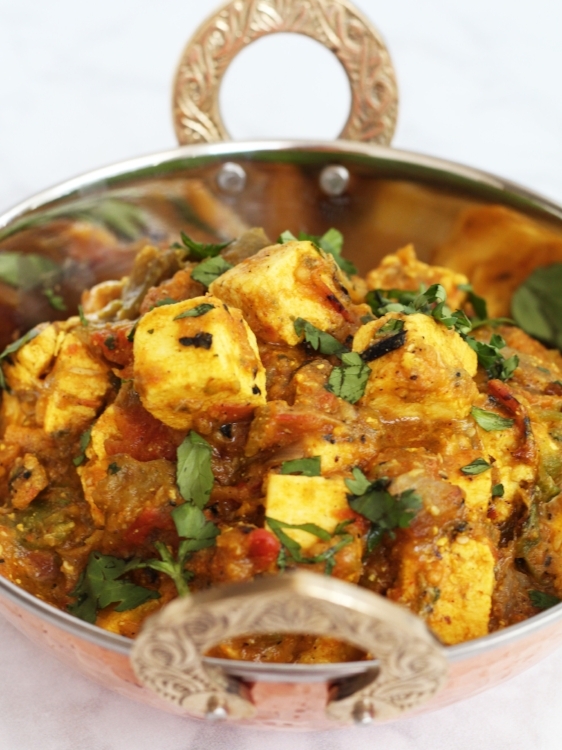 Paneer is widely used for Indian cuisine, so you'll see a lot of recipes based on paneer coming soon. If you've never tried it, give it a try, you'll love it! For this recipe, I marinated paneer with spices and lime while I made a fresh batch of salsa. You can marinade this overnight, but as long as you let it rest for about 30 minutes, you should be fine. You'll notice in this recipe and the upcoming ones that I limit the amount of oil/butter that I use for cooking. I think that it's so much better to use the fats for flavor, rather than for the cooking process, but if you're not particular about your fat consumption, feel free to change the ratios. For example, for this dish, I used cooking spray to sautee the paneer. I added half a tablespoon of ghee just for flavor. If you're not familiar with ghee, it's an Indian version of clarified butter, it has a stronger flavor than butter so you can use less without compromising flavor. Again, I'm just using ghee for flavor, so feel free to substitute with butter or leave it out all together. You'll notice that I didn't use low-fat paneer, again, I'd rather use less fat in cooking and keep the fat where it makes a big impact. If you are really watching calories and fat, you can substitute with low-fat paneer but lower your heat while cooking it. Hope you enjoy this dish as much as we did! You can serve it with a side of rice, or get some tortillas and make yourself some tacos. 1. In a medium bowl combine turmeric, cumin, coriander, garam masala, paprika, salt, and lime juice to create a marinade. 2. Add paneer to the bowl and mix gently until paneer is uniformly covered with marinade. 3. Cover the bowl and let it marinate in the fridge for at least 30 minutes. 4. Get the molcajete salsa ready by roasting the ingredients and grinding them in the molcajete. If you don’t have a molcajete, follow the instructions to roast the ingredients and pulse them in a food processor or blender until you reach the desired consistency. 5. Spray a non-stick pan or kadhai with cooking spray (or 1 tablespoon of oil), preheat at medium heat. Add ghee. 6. Sautee the marinated paneer, gently turning it until all sides are slightly golden. 7. Add salsa and gently mix in with the paneer until the salsa has warmed up. 8. Top with fresh cilantro.